Yutopian book, published 1996. Translated by John Fairbairn from a Japanese original by Rin Kaiho. A discursive book based around tesuji problems. BlueWyvern - I just got a copy of this book, and it may very well end up my favorite go book of all time. The approach of the book is fairly unique, and it makes for quite an entertaining read. 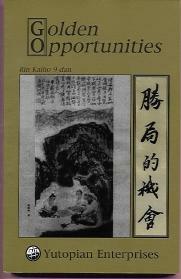 The book is basically about tesuji's of all sorts in the context of golden opportunites to turn around a game or to take a decisive lead. The examples are compelling for two reasons. One, a good many of them are taken from amateur games, in contrast to a lot of books I have read where the examples are mostly pro games. The second is that Rin draws parallels to his examples from the most astonishing array of historical and fictional sources, ranging from Napolean's invasion of Russia, to Pulitzer's election, to the invention of non-button men's underwear. While it's too early to tell because I just bought the book, it feels helpful, and on top of that is an interesting read. There is a historical appendix that explains references to things like the Meiji restoration shinsengum, and Zenigata Heiji, the Japanese Sherlock Holmes. I'd suggest this book to any go player just for the sheer enjoyability of the read. ZenGarden I highly recommend this book for anyone who wants a thought-provoking series of intelligently explained tesuji problems. Ideal for commuting journeys to the office. If you go through the problems and really analyse the solutions suggested, they create patterns you won't forget and will be able to apply in future games. An excellent book all round!